Bakersfield College alumni Al Black jumps into the fringed pool with a host of other brave souls to swim a lap at the first annual Polar Bear Swim and Dip to help raise money for the BC swim team. 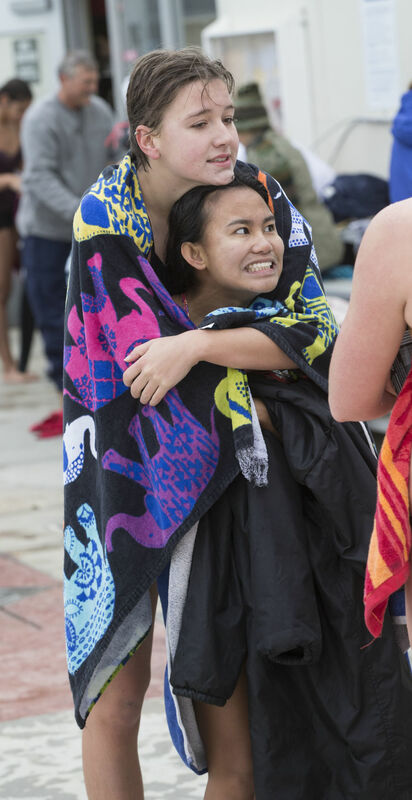 Bakersfield College swim team members Sarah Cobb and Aliyah Pilien try to get warm after swimming a lap at the first annual Polar Bear Swim and Dip to help raise money for the BC swim team. Polar Bear participant Ken Berckes celebrates his accomplishment after swimming a lap at the first annual Polar Bear Swim and Dip to help raise money for the BC swim team. Bakersfield College swim coach Matt Moon is interviewed by a television station at the first annual Polar Bear Swim and Dip to help raise money for the BC swim team. It may be far from summer, but that didn’t stop people from taking a swim in the Bakersfield College pool on Saturday. The college held its first Polar Bear Swim and Dip to raise money for its swim team. Participants were able to either take a quick dip in the icy pool before quickly getting out or doing a 25-yard swim across the pool. Afterward, attendees were able to enjoy some warm refreshments, including coffee and cocoa.